- tado° is your Climate Assistant designed to make your live more comfortable by taking care of your comfort and savings at home. Get easy access and control of your heating system via the tado° app from anywhere, anytime. - NEW V3+: Air comfort Skill: provides insights about your home's air freshness & outdoor air Quality and helps you maintain a healthy climate at home. Auto-assist Skill option for more convenient control of your heating (available in-app, can be purchased & cancelled at any time for only 2.99/month). - Add a tado° Extension Kit as an additional product of the Smart Thermostat Starter kit V3+. It enables you to control your hot water. 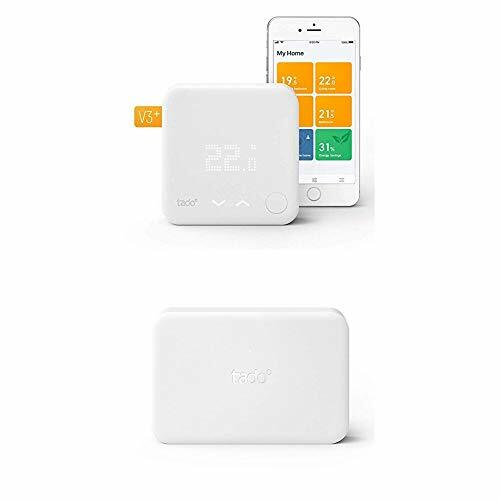 It's also needed to connect the tado° Smart Thermostat to your heating system if there is no room thermostat or if you have a wireless room thermostat. - A tado° extension kit with the Internet Bridge forms the basis of your setup.